Orders of the LG G watch and Samsung Gear Live from Google Play are due to begin shipping very soon, so Google is doing everything it can to prepare for those arrivals. It is pretty clear that the first move was to get all sorts of popular apps on board with the Android Wear movement, have development teams prepare updates for those apps, and then feature them in a new, dedicated section on the Play store. That section is now live, along with a number of apps you probably use on a daily basis. At this time, Google is listing out apps like Level, IFTTT, Duolingo, 1Weather, Pinterest, American Airlines, Delta, Contacts+, Banjo, and even Google Maps. They missed the new Evernote Wear, Trello, and Runtastic, so there may be even more out there that have yet to slip onto this page. The updates introduce specific features for Android Wear, like how Pinterest will show you nearby places you have pinned on your watch. Level will show you latest transactions, Contacts+ lets you bump watches together to exchange info, and 1Weather brings you weather in a different way than Google Now. 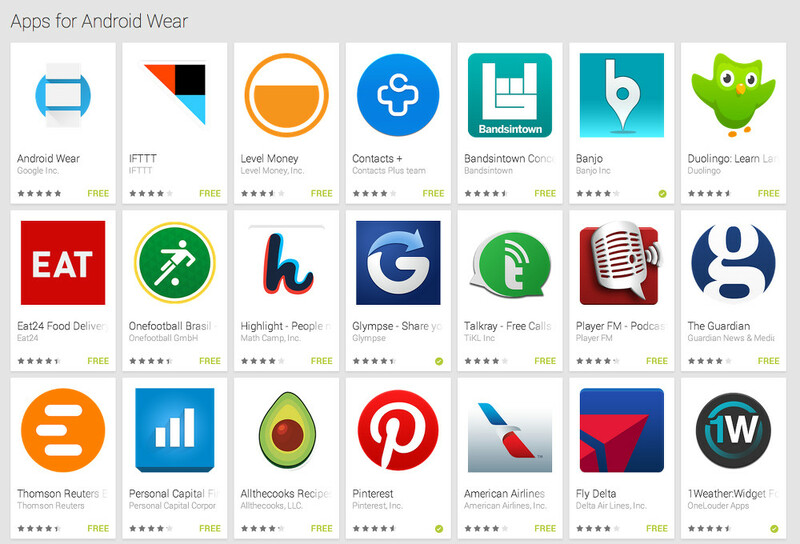 To view the current list of Android Wear apps, head to this Google Play link. If you have an Android Wear watch coming or plan to buy the Moto 360 whenever Motorola gets around to selling it, you will want to bookmark this page.